There’s something pleasantly strange about history. While most ancient towns have assumed the features of a modern urban settlement, there still are a few places in India where time seems to have stopped at a certain era. Despite basic commercialization, these places will make you wind back in time and see through the cracked walls and relics of its grandeur and into the period when it was at its best. The district of Mahbubnagar in the state of Telengana is definitely one such place. Sitting on the southwest edge of Telengana and bordering Karnataka, Mahbubnagar is a standing testament of its princely past. Mahbubnagar or popularly called Palamoor, was earlier called Rukmammapet. Later in 1890, when the 6th Nizam of Hyderabad- Nawab Mir Mahbub Ali Khan Asaf Jahi VI assumed the throne, the name was changed to Mahbubnagar in his honor. However, the region which comprise the district was the erstwhile kingdom of the Satavahana Dynasty from 221 BC to 218 AD. Later it also remained a part of the Chalukya Kingdom from 5th century to 11th century, then of the Kingdom of Golkonda, the Qutab Shahi dynasty and finally came under the control of Asaf Jahi dynasty in 1724. The town of Mahbubnagar is roughly 110 Km from Hyderabad and takes about two and half hours. For a day trip, hire an affordable and highly rated cab service from Hyderabad and head out on NH 44 to reach the historic town. Built somewhere between 7th and 8th century, this is the oldest terracotta style Jain temple. This is one of the two structures of its kind built during the Gupta Empire, the other one being in Kanpur, Uttar Pradesh. The temple once housed rare stone structures of Mahavira, Parsvanatha, and few other prominent figures of Jainism, which have been removed to the nearby museum in Pillalamarri and the State Museum. About 78 Km from Mahbubnagar bus station, the Gadwal Fort is one of the popular historical attractions in this district. The massive fort was built by Peda Soma Bhupaludu- the famous ruler of Gadwal. Although mostly in ruins, you can still see the huge walls that fortified the fortress inside and the moats built around it. The fort premises house three temples, of which the Chennakesava Temple is the grandest with its high temple tower, stone dais (mandapa) and intricate carvings on the exteriors. There is also a 32 feet long cannon that the ruler of Gadwal won over from the Nawab of Kurnool. This fort area makes for a thrilling day trek. You can start hiking from the western side of the fort across a deep gorge and reach a flight of stone steps that lead to the fort. 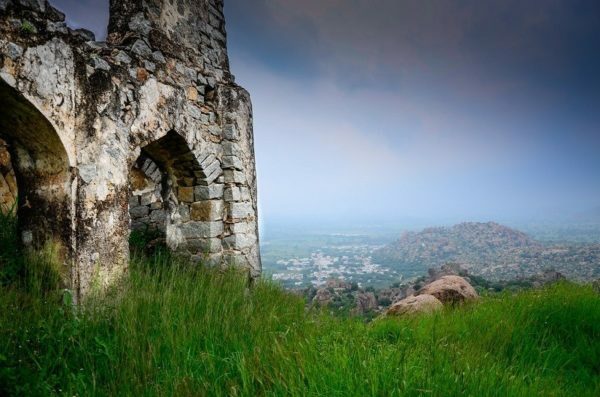 Perched atop a small hill, the Koilkonda Fort once used to be the outpost of the Qutab. You will need to cross seven gates to be able to enter the main fort area. The first gate has inscriptions of Ibrahim Qutb Shah from 1550 AD. There is a derelict palace, a mosque, an Idgah (an enclosure for offering morning prayers during Eid), and a revered congregation hall. Also called Peerla Marri, is a natural enclave with an an 800 years-old banyan tree and is the most attractive aspect of Mahabubnagar district. Over the years, the oldest tree has branched out into smaller banyan trees creating a dense foliage across three acres of land. The shaded area makes for a relaxing time in the outdoors. There is also a mini zoo with birds and other animals in the area. If you are a lover of history or all things antiquated, then you must put this tranquil little town on your next weekend getaway from Hyderabad.